Here's how you can track and down and battle the Nergigante in Monster Hunter World. The Nergigante is looked on as one of the more intimidating foes in Monster Hunter World, and rightly so. In this Monster Hunter World Nergigante guide, we'll be walking you through everything there is to know about the monster, and how you should go about facing it in battle. If you instead need anything else on the complex game of Monster Hunter World, including how to successfully capture a monster, as well as how to quickly track down any monster in the game using the Scout Flies, head over to our Monster Hunter World guides walkthrough hub. After you've spent a lot of time tracking the Monster Hunter World Nergigante, you'll finally have a chance to take down the beast once and for all in the Elder's Recess region of the world. This is your first fight with an Elder Dragon in the game, and while you've faced off against the Nergigante before on the back of Zorah Magdaros, those previous fights are nothing compared to the one ahead. 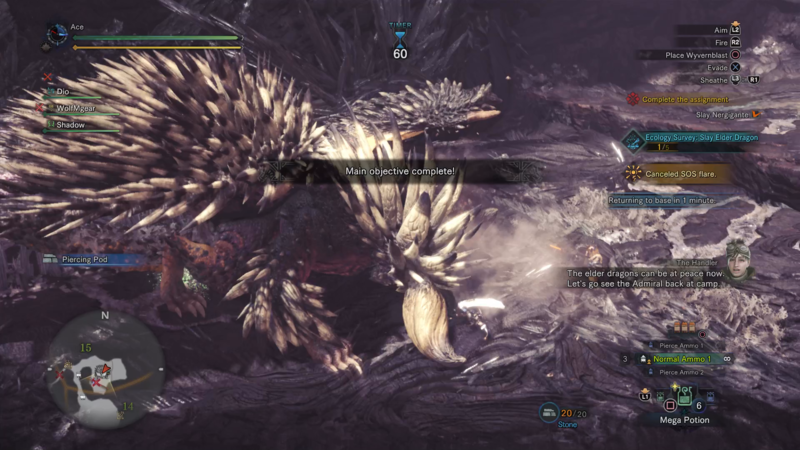 Unlike other fights in Monster Hunter World, we're going to recommend using an SOS Flare against the Nergigante. 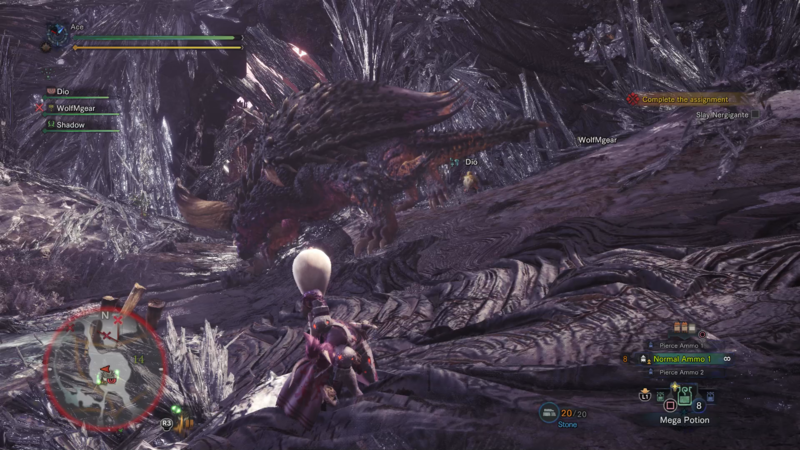 You can fire off the flare once you've started the quest to take down Nergigante through the pause menu, and this will allow other players to instantly jump into your game. Although this will actually increase the difficulty of the quest overall, it's basically essential that you go in with a team against the Nergigante. If you instead choose to go up against Nergigante on your own, then we'd recommend simply equipping the most powerful weapon you have, as you'll have to rely on your dodging skills to get you through the fight ahead. If you plan on firing an SOS Flare and taking down Nergigante with multiple other players, then we'd lean towards using a ranged weapon against the beast, letting the other players wade in with close ranged weapons like the Dual Blades or Hammer, or hang back with you, taking a strong Bowgun into battle. The Nergigante doesn't really use elemental attacks, so we'd simply recommend taking in the most powerful set of the armor you can get your hands on. 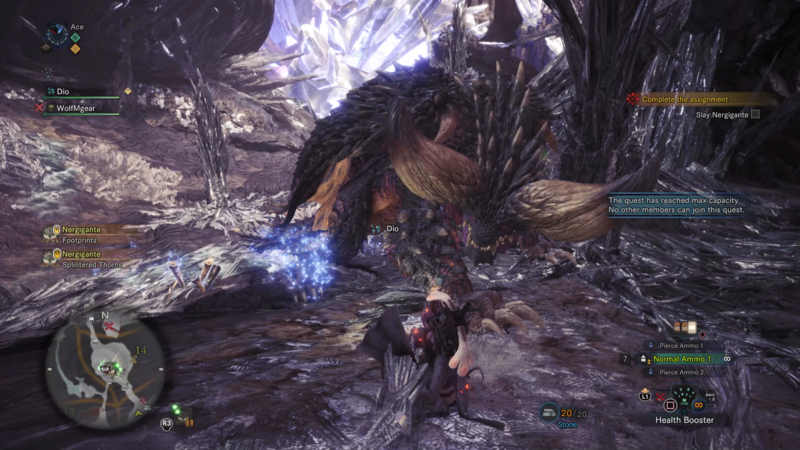 The Nergigante is weak to electricity however, and an electrical attack to the head can stun the beast for a short amount of time. You'll also want to make sure you equip the Health Booster item in your gear slot for the mission, as you'll need to plant it on the battlefield whenever you can in order to help your team heal quickly. For the actual fight against the Nergigante in MHW, learning the attack patterns of the monster is crucial. You'll want to eat a meal before you go in that'll boost either your health or defense, and once you're in the actual fight, learning when to dodge is crucial. The attacks you mainly want to take note of are the Nergigante's ability to leap across the battlefield, slamming one claw down on the ground, and when it rises up into the air, coming slamming down on any players in front of it. You're going to want to move as soon as you see either of these attacks developing, and in the case of the latter attack, we'd recommend stowing your weapon and sprinting parallel to the Nergigante, to give you the maximum chance of avoiding its attack. When you eventually have the Nergigante wounded and limping, it'll always retreat to the same small cavern at the back of the Elder's Recess map. It'll fall asleep here, and we'd recommend sharpening your weapons, placing barrel bombs, and using health boosters before you awaken the beast for the final phase of the fight. Dodging is everything in this stage, as you're in close quarters against an extremely volatile Nergigante. Remember to always keep putting down your health boosters whenever your teammates ones expire, and you'll always have a solid chance of beating Nergigante. Now that we're all done with how to successfully take down the powerful Nergigante, why not continue to any of our other Monster Hunter World guides, including our guide to the best armor in the game, as well as our complete weapons guide.